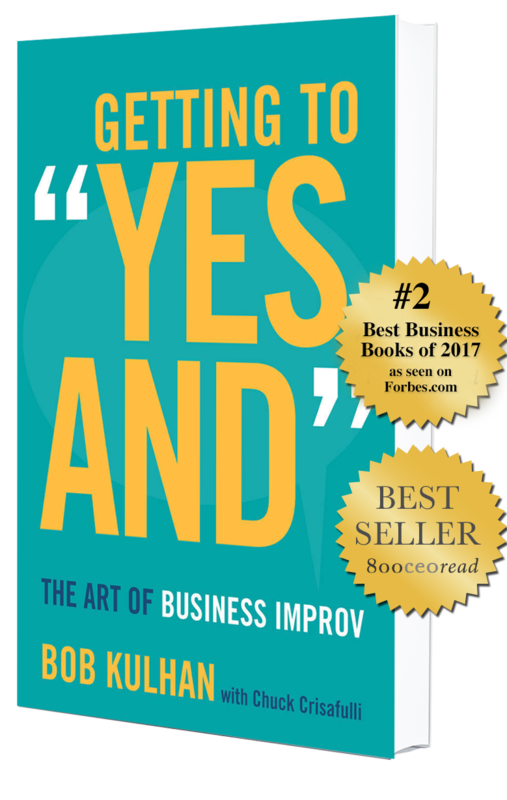 About the book - Getting to "Yes And"
Amidst the deluge of advice for businesspeople, there lies an overlooked tool, a key to thriving in today’s fast-paced, unpredictable environment: improvisation. In GETTING TO “YES AND” veteran improv performer, university professor, CEO, and consultant Bob Kulhan unpacks a form of mental agility with powers far beyond the entertainment value of comedy troupes. Drawing on principles from cognitive and social psychology, behavioral economics, and communication, Kulhan teaches readers to think on their feet and approach the most typical business challenges with fresh eyes and openness. He shows how improv techniques such as the “Yes, and” approach, divergent and convergent thinking, and focusing on being present can translate into more productive meetings, swifter decisions, stronger collaboration, positive conflict resolution, mindfulness, and more. Moving from the individual to the organizational level, Kulhan compiles time-tested teaching methods and training exercises into an instrumental guide that readers can readily implement either as a party of one or a company of thousands. Bob is a thoughtful and caring teacher of improvisation. He's a tireless champion of the art form and he'd stop me from singing his praises if that didn't directly contradict improv's first rule: Acceptance. Deal with it, Bob. Awards and praise for Getting to “Yes And” ! © 2019 Getting to "Yes And".